Cyperus schweinitzii is a perennial C4 sedge (Li et al. 1999), from a knotty root crown, 10 cm to 1 m tall, stem rough, sharply angled, 0.2 cm thick. 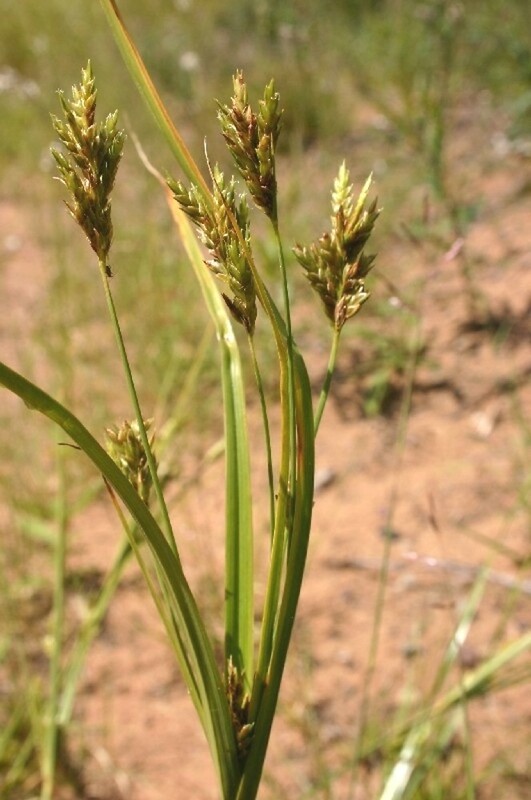 Leaves basal, 0.2-0.8 cm wide, margins rough; bracts below inflorescence upward pointing, usually longer than inflorescence. Flower spikelets with 5-18 flowers, flattened, 0.5-2.5 cm long, 0.3-0.4 cm wide, all pointing upward; flower scale broad, about 0.3 cm long, tip pointed veins numerous, conspicuous; Inflorescence of several clusters of spikes, the lowermost stalkless, the upper spikes 10 cm tall or less, crowded. Fruit a dark achene, 3-sided, 0.2-0.3 cm; blooms and fruits July-Sept.
Habitat: Open, dry sandy soil, coastal.